This is one of my most fav paintings. 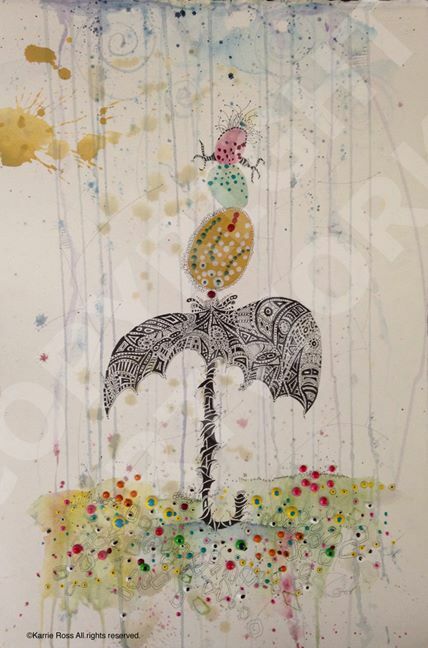 “Umbrella and Eggs!” was a fun and explorative piece when I made it. I was just beginning to go in this direction again and adding the eggs and their whimsey was new to my thinking. I very much like the way this turned out and was excited to show it in the recent LA Artcore Union Center for the Arts, Los Angeles show in August. 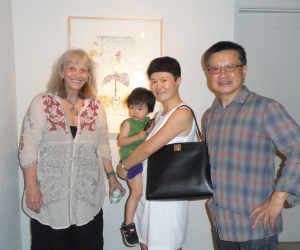 And to have it sell to another fine artist, Xi Hou, just made my evening. I am told the work will go in her daughters room. Can’t think of a better way to live out its days. This entry was posted in Notes: Karrie Ross, SOLD! and tagged la artcore union center for the arts, los angeles fine artist, Notes: Karrie Ross, Sold Karrie Ross artwork, umbrella and eggs on September 8, 2014 by Karrie. Subscribe here to Karrie’s Updates with RSS Website Feed! Little Gold Leaf Precious Pieces of Art! Getting All Shook Up On Art…. Copyright, Terms ©2001-2018 and beyond Karrie Ross, all rights reserved.